We hand-craft our special soups in small batches to accentuate each soup's unique flavor. Follows are some of our favorites; call for today's selection. 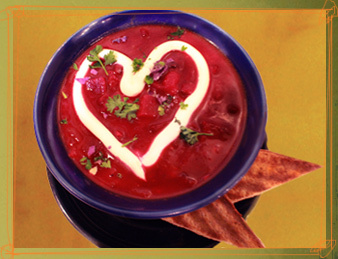 Russian Beet Borscht – Our version of Mother Russia’s most beloved soup. Made with beetroot, cabbage, spices and topped with sour cream. Burmese Lentil – Red lentils with gently sautéed onions, potatoes, chilies, and spices make for a healthy, hearty soup with more than a hint of spice. Dead Gal Cheddar – A special indulgence made with sharp cheddar cheese, onions and heavy cream. Finished with a bottle of Rogue Dead Guy Ale. Cajun Buffalo Chili – Full Circle Bison with red beans, a Louisiana mirepoix and a bit of mojo makes for a hearty meal. Garlic Chipotle Chicken – Hints of smoked chilies and African spices compliment the garlic in a combination that will knock the bite out of your worst cold and put a smile on your face. Fiesta Black Bean – Just an ordinary black bean soup… yeah right! An intricate array of Mexican spices creates rich flavors with a soft kiss of cayenne. Roasted Garlic Potato – Guilty pleasure in a pot. Garlic, potatoes, cream… but please don’t think of it as mashed potato soup (we cringe at the thought). Coconut Curried Yam – Ahhhh. People write poems about this soup and beg for the recipe of this naturally sweet favorite. It’s really quite simple: we simmer garnet yams, onions and sweet curry with our own special spice mix. 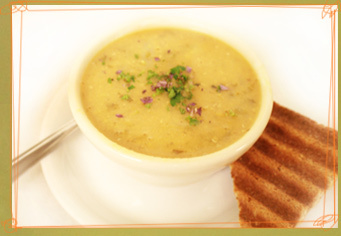 Indian Split Pea – Green split peas and garden vegetables infused with turmeric, coriander and cumin. Lentil Dahl – A traditional Indian dish. 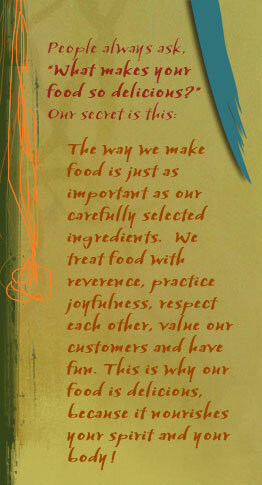 We make ours with green lentils, onions, peppers, tomatoes and aromatic spices. Moqueca – Brazilian fish stew with white fish, onions, garlic, tomatoes, cilantro and chili peppers slow cooked in coconut milk. Mushroom Parmesan – A sauté of onions and mushrooms simmered in a creamy tomato broth and finished with shredded parmesan and parsley. New England Clam Chowder – Our secret is the ‘blond’ roux. Most cream soups use a white roux, but why be so bland? The result is a richer tasting soup that won’t weigh you down. Of course there are other ingredients: clams, onions, peppers, potatoes and our own special Pangea Spice Mix. Portobello Bleu Cheese – We blend sautéed portobello and field mushrooms with bleu cheese, until it’s as smooth as a baby’s tush. This favorite turns otherwise normal customers into raving fans. Potato Leek – But of course we use the whole leek, and slow cook the potatoes, teasing out their startches for a delicious and creamy experience. Thai Coconut Corn – Coconut milk and Thai curry with a rainbow of vegetables emphasizing sweet corn, this soup is as beautiful as it is delicious. Moroccan Lentil Lamb – We oven roast Australian, pasture-raised lamb in a spice crust before adding it to the sauté. Our authentic Ethiopian spice blend and fiery African berbere give this soup its distinctive flavor. Summer Melon Soup – Seasonal melons and berries with coconut milk, lightly seasoned with agave and a trace of cayenne. Minted blueberries finish the soup for an enchanting, cool experience. 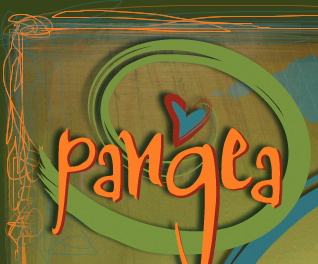 Vote to include your favorite in the Pangea Cookbook.